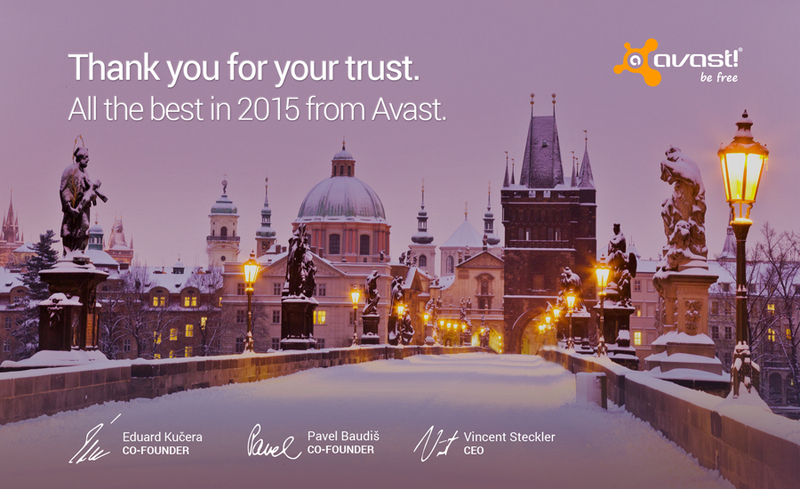 Happy New Year 2015 from Avast! From our headquarters in Prague, Czech Republic to our offices in the USA, Germany, China, and South Korea, all of us at Avast Software wish you love, laughter, and peace in 2015. Looking back on 2014, we are grateful for the trust that our 220 million customers have placed in us. We thank you for your loyalty and for sharing Avast with your friends and family. We appreciate your support, your suggestions and feedback (even when it's not so good ;) ), the way you help others on our forum and social channels like Facebook, Google +, and Twitter, and especially when you write us with your stories of how Avast saved the day for you. As we enter this new year, we promise to bring you the best security products for your home network, your business, your PCs, Macs, and Android devices, that we can. We will stay on top of new threats and contain the old ones that keep coming back to plague us. We will strive to keep your trust, but most of all, to keep you and your important data and hardware save from harm. So raise your glass with us, and join us for our 2015 wish.